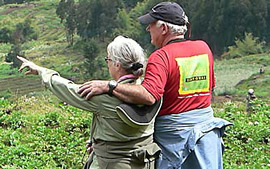 The 7 Days Rwanda-Uganda double gorilla and chimpanzee trekking safari is a bespoke package to Volcanoes national park and Bwindi forest national park for gorilla trekking, golden monkey trekking, cultural tours in Rwanda, game drives and boat cruise in Queen Elizabeth National park and Chimpanzee Trekking in Kibale Forest National Park. The safari starts in Kigali Rwanda ending in Kampala Uganda. Day 2: Day 2: 1st Gorilla Tracking Adventure and cultural walk. Day 3: Day 3: Golden monkey tracking and transfer to Bwindi NP. Day 4: 2nd Gorilla Tracking and transfer to Ishasha sector. Day 7: Transfer back to Kigali/Kampala and departure. Day 1: Transfer to Volcanoes NP. Your tour guide will pick you from the airport on arrival or Hotel in Kigali and take you for a city tour. Visit the genocide memorial, Nyamata church, local markets among others. 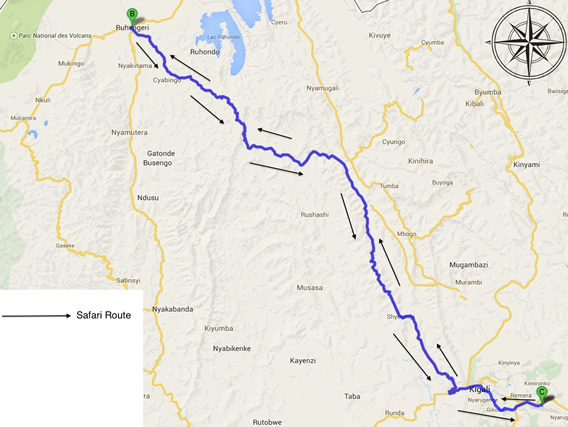 You will then drive northwards to Volcanoes NP with en route views of the Virunga mountains. Overnight at Muhabura hotel (budget)/ Davinci lodge (deluxe)/ Gorilla Solution lodge /Five Volcanoes hotel (luxury). Day 2: 1st Gorilla Tracking Adventure and cultural walk. In the morning, you will go for golden monkey tracking in Volcanoes NP and on return, transfer across the border to Bwindi NP in Uganda. Dinner and overnight stay at Gorilla Safari Lodge (Luxury)/ Bwindi Jungle Lodge(Deluxe)/ Gorilla Mist camp (budget). In the morning, you will gather at the park headquarters for a briefing, and go straight into the forest to search for the gentle giants. You will be allowed one hour to stay in the presence of the gorillas, as you observe and take photographs. On return, you will transfer to the Ishasha sector of Queen Elizabeth NP. Dinner and overnight at your Ishasha Wilderness Camp (luxury)/ Ishasha Jungle lodge (deluxe). Day 5: Transfer to Queen Elizabeth National Park and boat cruise. In the morning, you will go for a game drive in the Ishasha sector of the park for a chance to see the tree climbing lions. You will later drive northwards to kazinga channel for the afternoon boat cruise. Dinner and overnight at Mweya safari lodge / Katara lodge(luxury) /Park View Lodge(deluxe)/ Enganzi lodge (budget/deluxe). Day 6: Transfer to Kibale Forest NP and chimp tracking. In the morning, you will drive to Kibale Forest NP. In the afternoon, go for chimp tracking experience. If lucky, you may see other primates like several species of monkeys. Dinner and overnight at Crater Safari Lodge(Luxury)/Primates Lodge (deluxe)/Chimpanzee guest House(budget). In the morning after a relaxed breakfast, transfer to Entebbe airport passing through Kampala and departure. At Lake Kivu, our high-end choice of a lodge is Lake Kivu Serena Lodge. In the mid-range section is Paladise Malahide, Hotel Gorillas Lake Kivu, and Palm Beach Hotel, among others.